I finally got a chance to take the S4 out and test it on the water. It’s working beautifully with the Honda 2.3 engine. We actually have 3 people seat in it comfortably and both paddling and using the motor works quite well. Overall, I am very satisfied with the S4. Great Kayak and I can’t wait to show it off to my friends on the next fishing trip! I was too busy with the S4. There aren’t any pics while the S4 is cruising in the water since all three of us were in the S4 and didn’t have anyone to take pictures from the shore. I have been taking the S4 to many fishing and clamming trips and it’s working great and impressed a lot of people! A couple times we encountered bigger than expected swells so if it wasn’t the S4, we would have tipped over for sure. Most of the people who ride on it confirmed the S4 is the most stable kayak compared to everything they have seen. One small thing I noticed is that when we have close to max load on the S4 in the bigger waves, the water splashes front and gets in the cockpit, so I think the splash shield may help with this. 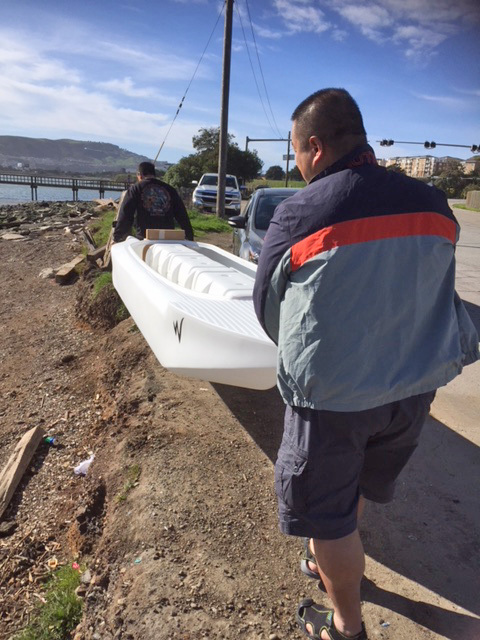 But if you must carry your kayak over long stretches of asphalt or concrete pavement, you may want to consider shielding its hulls from excessive abrasion by attaching the lid of a plastic bin to the part of its hulls that come in contact with the pavement. It’s an inexpensive, easy, and lightweight solution, and the lid can fold easily, so you can store it in one of the hull tips when you’re fishing and paddling. The drawback of dragging a kayak over long distances is that it’s not always as easy as transporting it on wheels. Kayak anglers have different fishing styles, and they fish in different environments. This fact, as well as logistic issues, affects the way they rig their fishing kayak with wheels (or a single wheel), a kayak trolley, cart or a simple mat. We put this benefit first, because kayak anglers are often enthusiastic about making a perfect kayak trolley, and they tend to overlook the fact that once they reach the water, they’ll have to take it with them on board their kayak. Kayak wheels should be lightweight and preferably small in size, so you could easily tuck them in one of the storage compartments in the hull tips, or on top of them. You definitely don’t want your wheel cart to fall apart while you’re on your way from your car to the water, or back. Wheels that are too small or too narrow could sink in sand, or in mud. Large diameter wheels perform better on rugged terrain. Wider wheels perform better on soft terrain, such as sand and mud. Sometimes you may need to pass with your fishing kayak in tight spaces. For example, in the space between two cars in a parking lot, or between big rocks, tree stumps, etc. In such cases, being able to control your fishing kayak on wheels is important. Attaching the wheels to your fishing kayak, as well as detaching them should be quick and easy, and the attachment system should hold the kayak in place without letting it slide or twist. 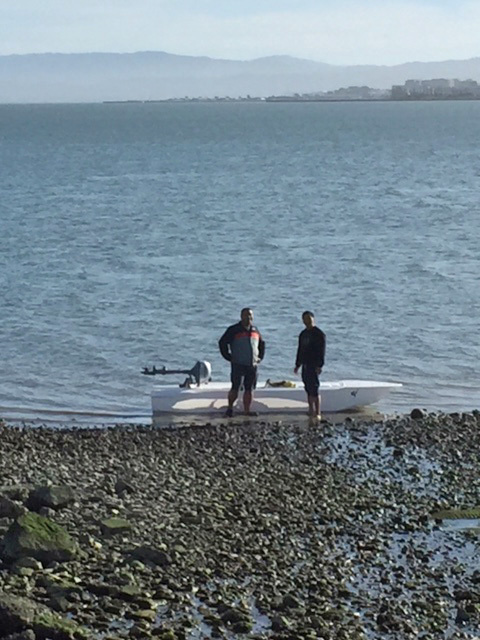 You definitely don’t want to waste time and energy on complicated systems for attaching your kayak to your wheel cart, and you don’t want to have to reattach the kayak on your way to the beach or from it. Unlike other kayaks, Wavewalk™ kayaks feature two handles on each end. Each pair of handles allow you to drive the kayak as a wheelbarrow, and benefit from good stability and control over it even if it’s outfitted with a single wheels attached between the hulls. having said that, the more fishing and camping gear you carry in your kayak, the more it becomes heavy, and this could make it harder to stabilize and control. This is when a two-wheel solution is better than one wheel. A picture is worth a thousand words, and words are unnecessary in this case. 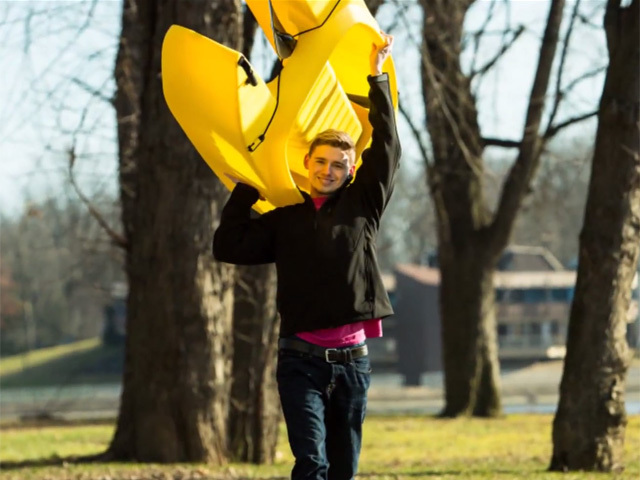 However, it’s worth noting that the smiling teenager in this picture is carrying on his shoulder a Wavewalk 500 F2 (fishing model) with a paddle attached to it. This section provides basic, ‘getting started’ tips and advice on using your Wavewalk® Fishing Kayak, and it offers links to other parts of this website that contain in-depth information. It is written in a sequential order of use, as much as possible. Always wear a Personal Flotation Device (PFD) when using your Wavewalk® Fishing Kayak. Do not wear heavy shoes or rubber boots, waders or any heavy or cumbersome clothes since they might prevent you from getting back into your boat or swimming back to shore in case you fall overboard. Never drink alcohol or take medication that might make you drowsy before and while kayak fishing. 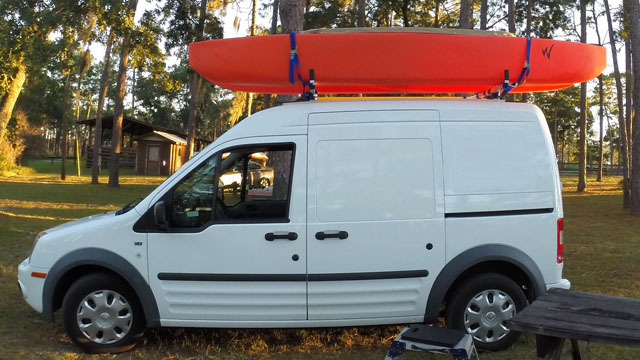 You don’t need a special kayak rack since the Wavewalk® Kayak fits on top of any car rack. 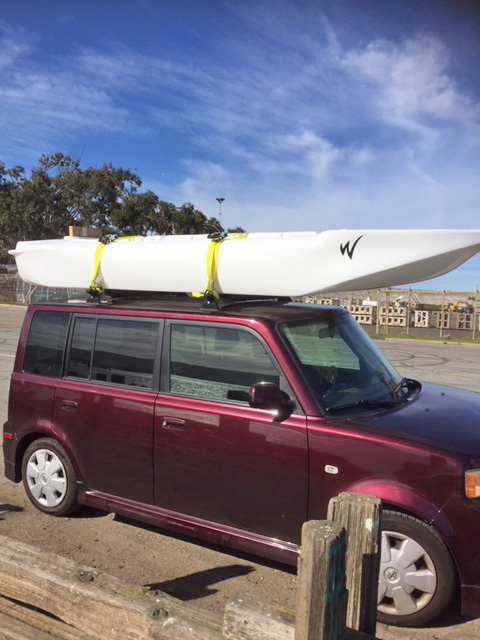 The easiest way to attach your Wavewalk® Kayak to the car rack is with its cockpit facing upward but you can also attach it with the cockpit opening facing sideways when transporting two Wavewalk® kayaks. 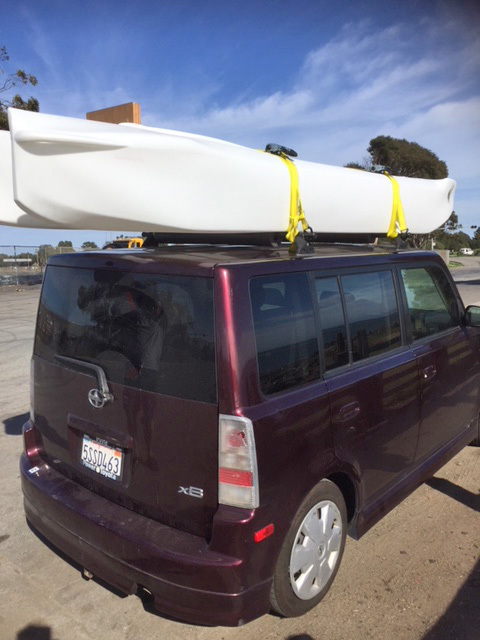 Use strong straps, bungee cords or rope to secure the kayak to the car rack. Note: All plastic boats are sensitive to the combination of excessive heat and pressure – Make sure your Wavewalk® Kayak doesn’t come in direct contact with exposed metal parts heated by the sun. On your shoulder (see ‘Downloading’) – For short and medium distances. Over your head with your head between the hulls and each hull supported by one of your shoulders and one of your hands – For short, medium an long distances. On your side: Hold the boat on its side with one hand gripping the cockpit rim in one hand supporting the lower hull – For short distances only. The Wavewalk® 500 kayak offers you 8.8 cubic feet (66 gallons) of dry and accessible storage space, which is more than any kayak does, including expedition style kayaks. Take the time to think and experiment before you take any definitive action like drilling, cutting or buying new gear. Finding the optimal solution for placing and attaching your fishing gear in your W Fishing Kayak might require more than one fishing trip simply because you have much more storage space inside and outside the boat, and therefore more possibilities to consider, test and evaluate. In general, it is advised to store heavier gear such as fish tank, battery etc. in lower places, and not to fill the cockpit with large size objects that may be attached on top of the hulls’ tips in front or behind it. You may want to read this website’s ‘Outfitting’ section as well as customer stories. 1. Regular: Put the boat halfway in the water and facing forward. Step into the cockpit from behind (no need to step in water) and install yourself on the saddle. You can get the boat to move forward by either placing a foot on the front part of the spray deflector and ‘kick’ and/or by pushing your paddle backward. When the boat is sufficiently in you can pole and paddle forward. Similarly, you can put-in standing. 2. 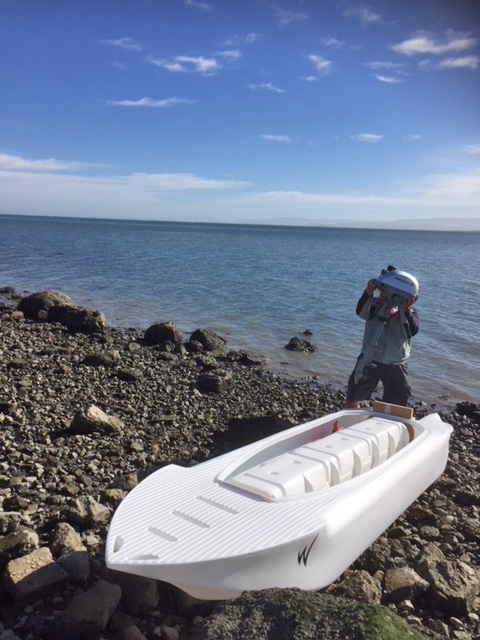 Surf launching: Standing in the water beside your Wavewalk® Kayak and lean over it while holding the two sides of the spray deflector. Then hop inside and start paddling. 3. Launching from a dock: Hold the boat in parallel to the dock and carefully get inside, one leg after another. 4. Seal launching (Warning: only for advanced paddlers): Put the kayak on a rock or a slope facing the water, position yourself in the back of the cockpit only in the Riding position, and slide down to the water while leaning backwards in order to minimize the impact. It’s possible to perform this trick from a dock or from a deck of a bigger boat. You don’t ride a chopper the way you ride a dirt bike, and canoeing is different from kayaking in a number of ways. in paddling there are some similarities between canoing and W kayaking, and other things that W kayaking shares with regular kayaking. In addition, there are also things that are unique to W kayaking. It is important to keep this in mind before you begin paddling your W Kayak in order to improve both your experience and performance. Beginning W Kayakers should start in the Riding position, that is with their legs and feet on both sides of the saddle in a direct line below their upper body (see picture on the right). Riding is the stablest position and it offers best control over the boat. This is especially true if you don’t have good canoeing experience and you’re not used to balancing a boat with your legs. Your experience with regular kayaks (SIK or SOT) may help you in some ways but it does not guarantee that you’ll learn faster because of the differences between ordinary kayaking and W kayaking. Riding is also very comfortable once you get to used to it. The Riding or ‘Mounted’ position is particularly stable and effective because all the muscles in your legs from your feet through your ankles, knees and hips can deliver quick, accurate and powerful reactions. Riding is a position that’s comfortable enough to allow horse riders to travel for thousands of miles during many months. In past centuries, a cavalry man would throw javelins, shoot arrows or slash his enemies with his saber – all while being mounted on his horse’s saddle, while a cowboy would use his lasso to catch and control cattle from the same powerful and stable position. Balancing: The right way to balance yourself in your Wavewalk® kayak is to hold the paddle with both hands and use your hips, thighs, knees, ankles and feet to respond to the boat’s lateral movement by gently shifting your weight from one leg to the other and keeping your upper body upright and centered. Leaning with your hand on the spray deflector is not practical at all. Also, unlike in ordinary kayaks keeping one of your paddle’s blades in the water is not recommended for balancing your Wavewalk® Kayak since it is better if you get used from the beginning to rely on your lower body to perform this task. Note: The new W700 car-top boat is so stable that it hardly requites any balancing. Do not confuse Riding (mounting) with Sitting – In the Sitting position your legs are positioned in front of you – see Figure 2. Sitting is not a recommended position for beginning W kayakers. For more information on the different paddling positions go to the ergonomics section. 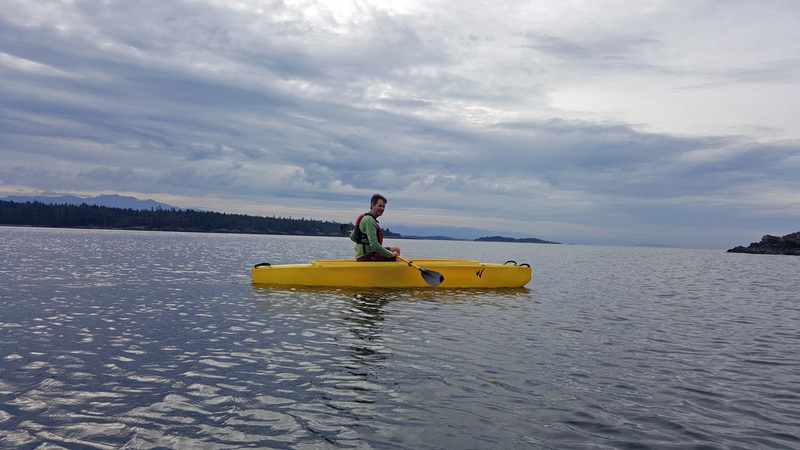 Getting used to the Wavewalk® 500 Kayak is personal and can take from a few minutes to several hours. It’s advised not to try to rush things and not to expect to become an expert Wavewalk kayaker after one paddling session – for many people it takes more time. There is a lot you can achieve with a Wavewalk® kayak that you can’t achieve with a regular kayak, and it’s only natural to need some time to learn it. You can move forward and backward along the saddle according to your needs and according to circumstances. For example, when paddling against eddies and waves you can sit in the back of the cockpit and by that lift the bow, which will make paddling easier, since you’d be going over the waves instead of through them. For more details visit this website’s surf and ocean section. You’ll find that poling your W fishing Kayak in shallow water is easy. We recommend that you pole using a long and sturdy paddle such as our Wavewalk® PSP, or a poling pole. 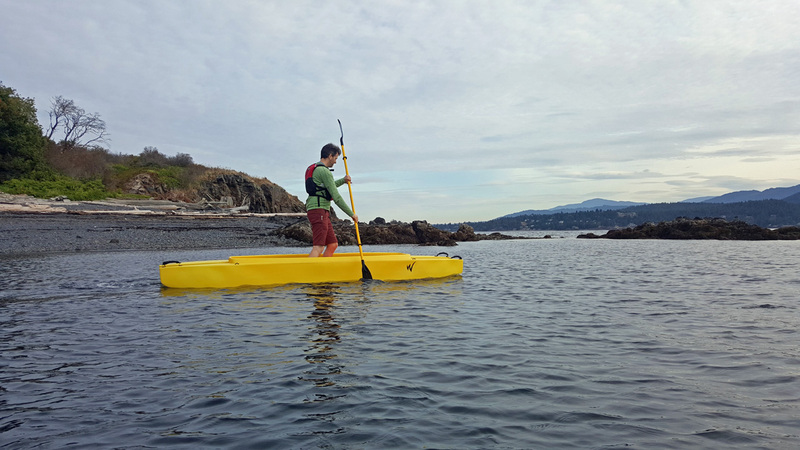 The advantage of the long and sturdy Wavewalk® paddle is the fact you can use it for both poling and paddling. You don’t need a rudder in order to turn sharply in your Wavewalk® Kayak: Turning is very easy if you lean into the turn and paddle on the exterior side. Caution: Since this is an unusual thing in paddling it is advised that you first get used to controlling and balancing the boat before you start leaning it into the turn. It is advised to do it carefully and gradually. Getting used to turning by leaning into the turn is personal and can take anything between a few minutes to several hours. You can lean into the turn in all positions but you can lean more effectively in the Riding, Kneeling and Standing positions, and less in the Sitting position. By the time you start practicing leaning into the turn you’ll probably know that beginning in the Riding position is best for you. 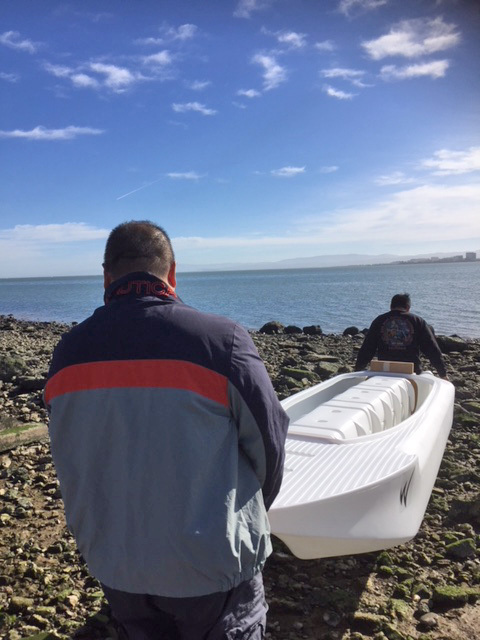 The ability to lean on one hull and paddle alongside the other hull is also useful when paddling in the surf. For more information visit this website’s surf and ocean section. You can move fore and aft along the saddle, and thus displace your Wavewalk® kayak’s center of gravity (CG). The heavier end will tend to point into the wind, while the lighter end will tend to trail. With occasional, minor adjustments of your position along the saddle, you’ll be able to track perfectly. The article features an online instructional movie. This kayak is the only one that offers true stand up paddling and fishing for everyone, in real life conditions, in the sense that you don’t have to be young and fit to do it, and once you get used to it, you won’t need to waste time and energy in continuous balancing efforts. True stand up paddling and fishing also means that in case you lose balance, you can simply, easily, instantaneously and intuitively regain your balance just by dropping to the Riding position on the kayak’s 14″ high saddle. This is critical for both convenience and safety. And needless to say tat rising from the lower position to standing is a breeze. To paddle standing adults need a paddle that’s longer than ordinary kayak or canoe paddles. 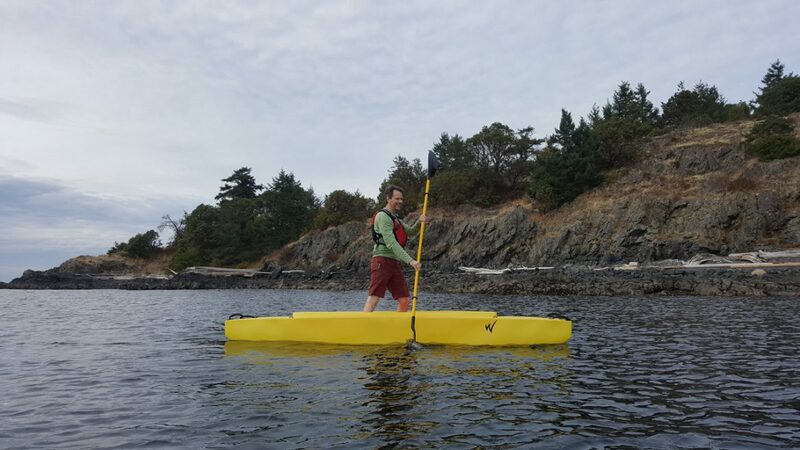 Our company offers two extra long and rigid stand up paddles that work perfectly for paddling in the lower positions too. 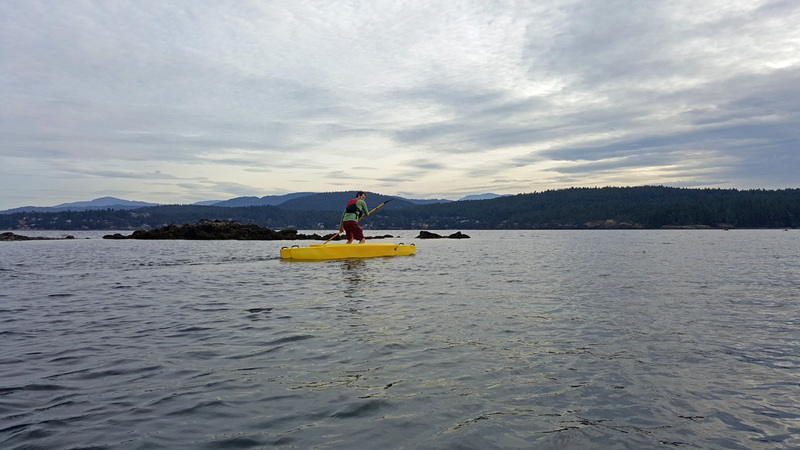 Children, teenagers and some people may find it as easy as paddling in lower positions but for most adult paddlers stand up paddling is a skill that can take some time to acquire, like any other skill, including kayaking. It is advised to begin practicing stand up paddling on flat water before venturing in moving water. To learn more about stand up paddling visit this website’s Stand up kayak paddling and fishing section. You can easily motorize your Wavewalk® kayak by outfitting it with either an electric motor or an outboard gas engine. We offer standard transom mounts for 15″ (short) and 20″ (long) propeller shaft models. We strongly recommend using long (20″) shaft motors rather than short (15″) ones. 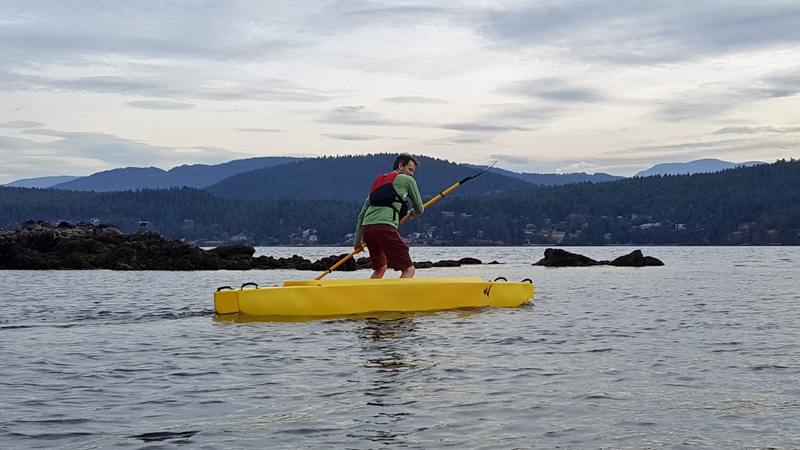 Motorizing your Wavewalk® kayak would greatly expand your range of travel, and could increase your safety since getting back to shore in bad weather and against a strong current is easier when motorizing than while paddling. 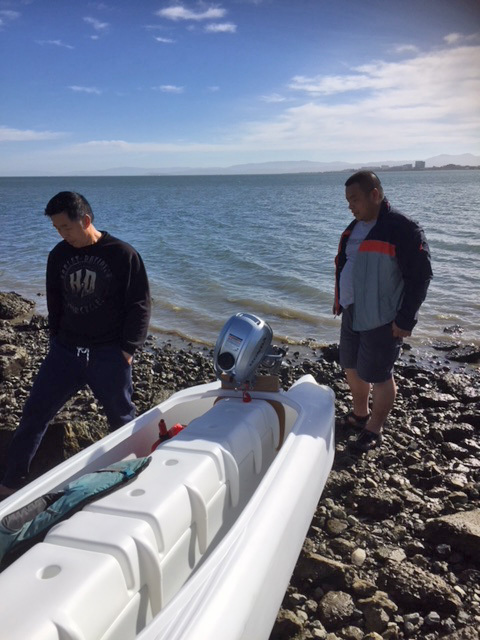 Before going on a motorized trip, verify that the wide wooden bolt knobs that secure the motor mount to the boat are safely tightened to the maximum. Failing to tighten the bolt knobs could result in unwanted vibrations and noise. If you feel such unusual vibrations and/or hear unusual noise, stop the motor, turn around, and tighten the bolt knobs to the max. Driving with loose bolt knobs is hazardous, similarly to driving with the motor’s clamp screws loose, and it could result in an accident. Never operate the motor without the motor’s stop switch (“kill-switch”) attached to your arm. For motor operation and maintenance please refer to the motor’s owner’s manual. Scouting is best done on flat water while paddling in the standing position. Since scouting is usually done at a slow speed without much maneuvering it is advantageous to learn how to paddle on one side of your kayak using a canoeing style J-stroke to keep tracking. Many anglers are concerned about spooking the fish by making unnecessary noise, such as when they drop their paddle in order to seize a fishing rod and cast a fly or a bait at a fish they’ve just spotted. These anglers usually outfit their W kayak’s cockpit with thick foam along its rim (coaming), which dampens the impact and noise of the paddle when they let it down to rest there, sometimes in a groove they make in the foam. Most dogs like to go on paddling, fishing, photography or hunting trips on board the Wavewalk® 500 kayak. You can easily drop an anchor is in the space between the hulls’ tips in front or behind the cockpit – according to your fishing needs. You can also make an adjustable anchor trolley system as shown in this website’s ‘outfitting’ section. If you fish in a stream you can use an anchor to slow your drifting downstream or a heavier anchor to keep your kayak in place. Some W anglers use an anchor pulley. For flat shallow water, using a stakeout pole can work better than an anchor. 2. Some fish species can sense the presence of your kayak nearby and therefore are better caught from a distance. You can cast to longer distances with any gear from the powerful riding position. The standing position is also good for casting to longer distances. 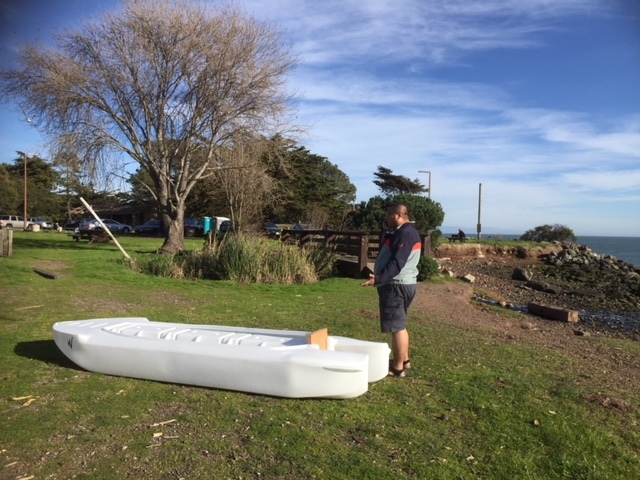 Casting from the sitting position is less powerful, although it still enables better casting than the traditional kayaking position does in other kayaks. You will find that netting smaller catch is very easy, and by gripping the fish through the net the hooks can be removed with minimal damage to the fish. As for bigger fish, dropping them in one of the hulls will assure that they don’t slip away and will give you the possibility to deal with them on your own terms. To enter your Wavewalk® Fishing Kayak from the back you need to position yourself behind it and grab the hulls’ two tips. Hoist yourself upward and start crawling upward and forward with your legs positioned on both sides of the boat. Use your legs to help you balance the boat. Doing it slowly and carefully is better than trying to rush things. After you have going forward enough over the cockpit just let your legs drop into the hulls, and position yourself in the stable Riding position. It is possible to perform this entry without help from other people if you do it slowly and carefully. Obviously, it is easier if someone can help you balance the boat by holding one or both handles in the bow. Position yourself on the side of the kayak with one hand holding the spray deflector. Push yourself upward and grab the spray deflector on the other side of the kayak, then quickly move one leg up and on top of the cockpit while your head and shoulders point in the other direction, so your body is in an angle and almost sideways to the kayak. This method requires more agility and fitness than reentry from the back of the kayak. If it doesn’t work and you feel the kayak isn’t stable, slide quickly back into to water, and then try again, or try reentering the cockpit from the back of the kayak. If one hull has water in it, it can serve as a counter-balance, and you should reenter the kayak from the other side. Berny designed and built this DIY Wavewalk with some help from us, and he named it “Banana Split” 🙂 . The load capacity and dimensions of this boat are comparable to those of the W700. Before you go back into the cockpit make sure the paddle is secured, and it’s not in your way. Practicing will improve your deep water entry skills. This website has a special section dedicated to surf launching, surf playing, paddling, surfing and beaching in this challenging, fun environment. Please visit our our surf & ocean page. Normally the interior of the boat stays dry, and if some rain or spray gets in it is drained to the bottom of the hulls where it does not bother you. Similarly to other small boats, when you’re on the water in your Wavewalk® Fishing Kayak you can drain it using a small bucket, a hand operated bilge pump or an electric bilge pump. Some W kayakers use a big sponge or a big towel for this matter. When the W Fishing Kayak is on dry land you drain it in no time just by grabbing the handles and overturning it. The water will drain out from the special drainage holes in the top side of the cockpit rim. 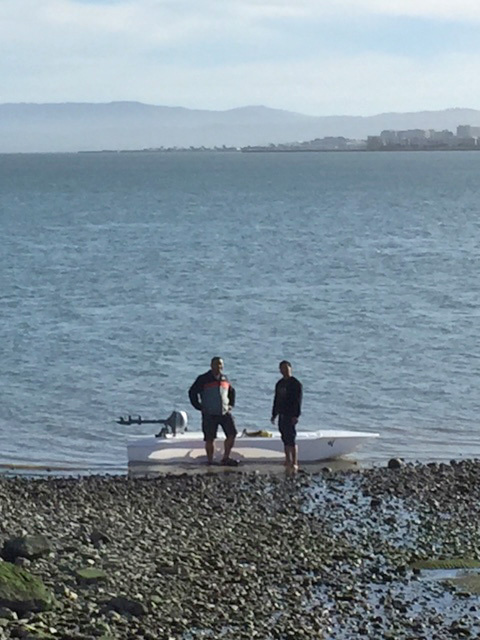 When beaching (taking out) you normally don’t have to step in water: When paddling to shore position yourself in the back of the cockpit – This will raise the bow and make it easy for you to advance high enough on dry ground. When stepping out from the boat do it from the front so you don’t have to get your feet wet. -Two children weighing less than 100 lb each can hardly be considered a real tandem in terms of the special challenges facing two full size paddlers i.e. adults. Paddling any kayak in tandem is always a challenge, but paddling a Wavewalk® Kayak in tandem is easier. Before anything, do not attempt to paddle a Wavewalk® 500 Kayak in tandem unless both paddlers are experienced W kayakers. The heavier and more experienced paddler should preferably ride in the back of the cockpit, where he/she can see what the new paddler is doing, instruct him/her and compensate for errors if necessary. Paddling a Wavewalk® 500 Kayak in tandem is not recommended if one of the paddlers weighs over 200 lb, and if the total weight of both paddlers exceeds 350 lb. Do not paddle in tandem in any position other than Riding, which is the stablest, and the one that offers best control. Do not attempt to paddle a Wavewalk® 500 Kayak in tandem at sea or on moving water unless you’ve gained considerable experience in W Kayaking in general, and in tandem W Kayaking in particular. You and your padding partner can paddle a Wavewalk® Kayak in tandem using either two canoe paddles, one canoe paddle and one kayak paddle, or two kayak paddles -What really matters is your teamwork, ability to understand each other and your individual paddling skills. Note: The W kayak is a small vessel, and like any other vessel it becomes slower and less stable when overloaded. You need to take into consideration these factors when planning any tandem activity with your W Kayak. Also, beaching in tandem is more difficult than solo because you can no longer raise the bow effectively. W kayaking in tandem can be a lot of fun if performed correctly and safely. Generally, it is not advised for two people to sit in a small boat and fish together since this is an accident prone situation. This is especially true for young and inexperienced fishermen. It is possible for two people fishing together from the cockpit of a Wavewalk® 500 fishing kayak to have one fisherman face the bow while the other faces the stern. This leaves more room in front of each of them for casting and reeling the fish in, but in any case both fishermen will not be free in their actions and they must be very careful in everything they do, and constantly aware of their partner’s actions. It is possible to paddle this way for short distances but only if the front passenger (I.E. the one facing forward) is paddling. 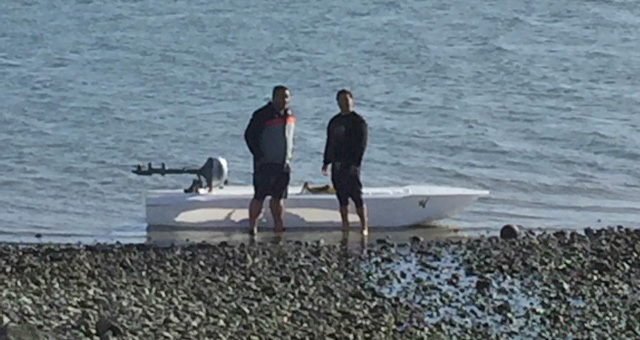 Since the W fishing kayak is totally symmetrical from bow to stern the two passengers can take turns in paddling. For example: while the one at the bow is paddling forward the other that’s facing backward can cast or troll providing he/she does it carefully. Turning inside the cockpit is easier for lightweight passengers, but heavier passengers can learn to do it too after some practicing. It is important to do it in full coordination with the other passenger, and advised to practice in shallow water first.. It is best for people fishing and/or paddling in tandem to do so in the riding position, which is stabler than sitting. It is not advised to stand in this kayak while two people are fishing from it. The proper way to store this kayak is with its cockpit facing up. Do not store this kayak with anything heavy resting on top of it, or with anything pulling its hulls apart. It’s best to cover the cockpit with a tarp, in order to prevent rain, snow, animals and insects from getting inside. You can store this kayak outside even in cold weather but you’d need to make sure it doesn’t get filled with water or snow, since freezing water expands and could damage it. You can store this kayak outside in hot weather and direct sunlight, although storing it in the shade is better in the long run. A Wavewalk® Kayak requires no maintenance, and you can store it outside in cold and hot weather. 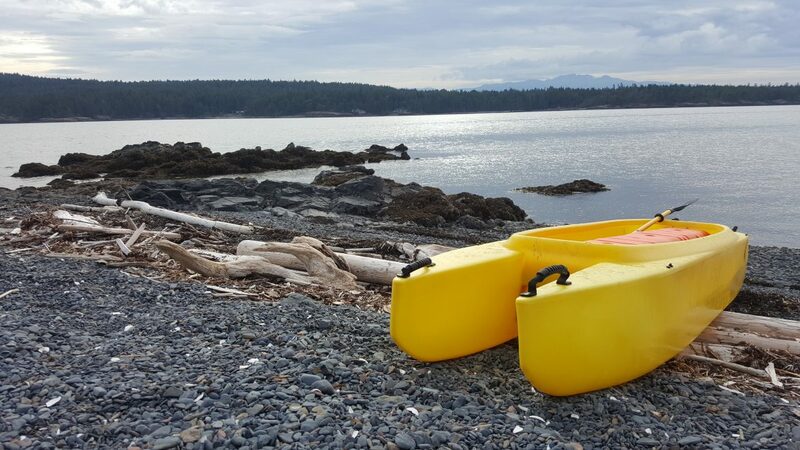 The W Kayak is rotationally molded from High Density Polyethylene (HDPE) which is stronger, more durable and more resilient than other materials used in kayaks and canoes. This is why it is unlikely to get damaged, but it also makes it difficult to repair so it is not advised that you try and perform repairs by yourself without first consulting with us. You will find that your Wavewalk® Fishing Kayak offers many possibilities and is very easy to outfit. For more information please visit this website’s outfitting and rigging page. Exceptionally tall and/or very heavy people, and/or people with certain physical disabilities can find it more difficult to paddle traditional canoes and kayaks. Similarly, such people might experience some difficulties in W Kayaking that most people won’t experience, or would experience to a lesser extent. Attaching outriggers to a fishing kayak offers limited benefits in terms of initial (primary) stability, and even less so with secondary stability. Outriggers significantly impede the kayak and make it harder to paddle. 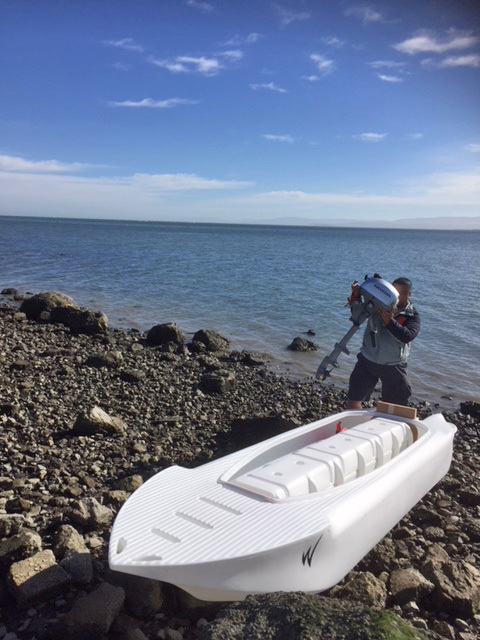 Outriggers are also known to limit the kayak’s mobility in shallow water where weeds and grass grow. Outriggers also reduce the kayak’s ‘fishability’ by snagging your lines. Please don’t hesitate to contact us by phone or by email if you need additional information. We’d welcome your comments and suggestions about the design of this page, and what additional information and links we should include in it.